Super Meat Boy x Smash Bros. + Overpowered Guns. The Game has four weapons: Knife, 3-Bullet Burst Gun, Sniper Rifle and Pistol. All of which kill in under half a second. Spritesheet samples. Game is created with Unity3d & 2dToolkit. Nerf Everything is a multiplayer 2D shooter, pitting elite Riposte Clobber-men against one-another in an original war-torn middle-eastern setting, with the most overpowered weaponry Modern Military Shooters have seen in the past decade. 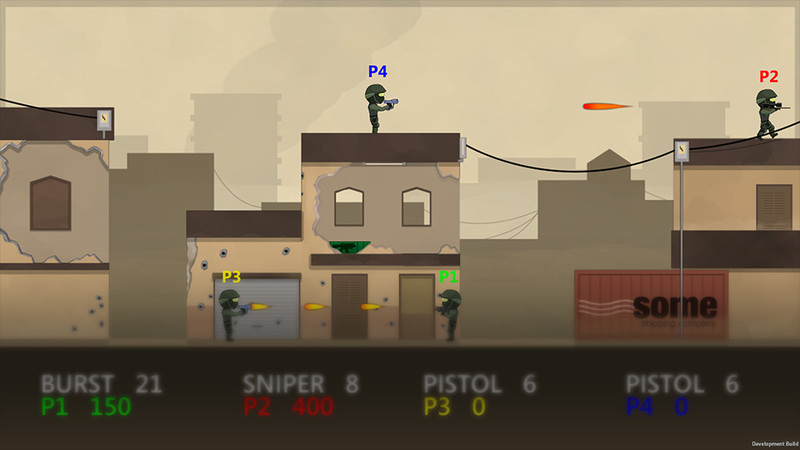 The game takes inspiration from titles such as Super Meat Boy, Super Smash Bros. and Call of Battlefield: Modern War-Strike of War. Note: This title requires two to four Xbox 360 Controllers. Sporadically Unity may fail to detect the correct controller ID and prevent <4 player games. Resetting the game may let you play the title, however four controllers are recommended to guarantee playability. 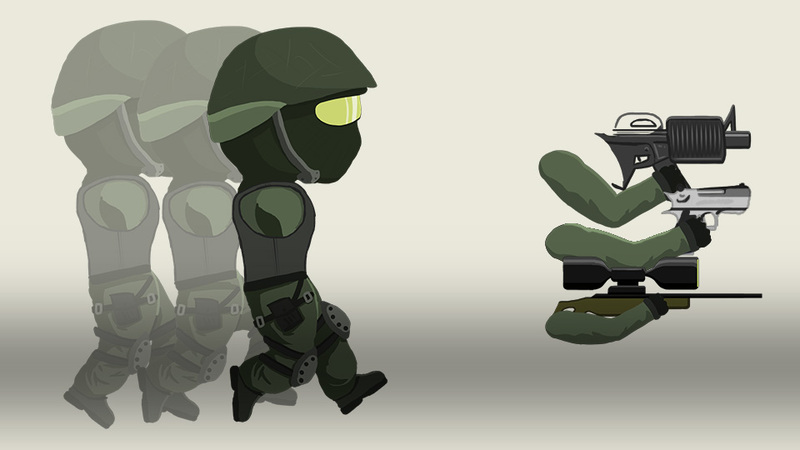 The game initially was created to gain an understanding of how to work with controllers in Unity. It turned into a pretty full-on personal project after the first playtest of the game against my brother, where we ended up playing against each other for almost an hour, fighting white boxes against each other. The main focus of the project was to make sure the characters were very responsive—floaty controls in a high-lethality shooter would be ultimately too frustrating to players due to them being unable to dodge a projectile that they feel they could have. Because of this, I sourced a CharacterController which did not use the Unity3d Physics engine. It provided the responsiveness that I had sort, but at the cost of a few peculiar issues, notably gravity problems. This is most notable when players walk off a platform without jumping - they'll often fall to the ground very quickly. Minor issues aside, I feel like the project was successful, despite the amount of content I had cut in order to move onto a new project. 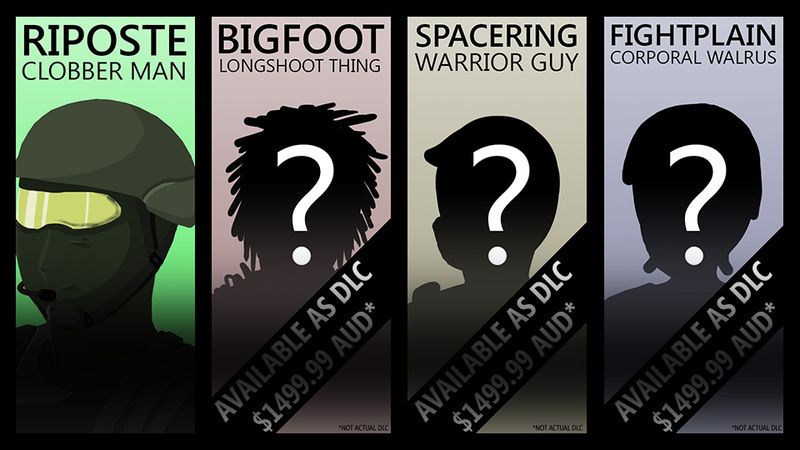 Initially I had planned on creating three other individual characters and at least one extra level, but it simply wasn't worth the time for me to design, animate and/or playtest all those additional assets for a title that is a portfolio piece.